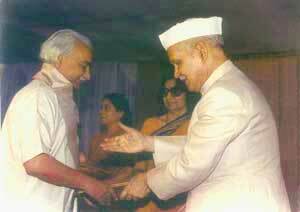 Recipient of Art Teachers Award 1989 presented by Vice President of India Shri Shankar Dayal Sharma. Recipient of Awards from Bombay Art Society, Hydrabad Art Society, Hydrabad, Bombay State Annual Art Exhibition at Ahmedbad, All India Fine Arts & Craft Society, New Delhi, Indian Academy Fine Arts & Craft at Amritsar, Punjab. Attended Artists campa and seminars organized by Lalit Kala Academy, New Delhi, Lalit Kala Academies of various states in the country - Art Societies and centres for promotions of Visual Arts, Regional Art Centre at Patiala, Punjab and Punjab State Art Academy Chandigarh, Punjab. Organized Art Exhibitons and one man showsat many places in the country. Last One-man show organized at Baroda in 1995. Made a mural on the life of Lord Mahavir (8'X20') which is displayed on the walls of Shri Vishal Jain Kala Shansthan, Palitana, Gujarat. Made a mural on life of Acharya Vijay Vallabh Suriji (72'X16') at Shri Attama Vallabh Smarak, New Delhi. Write ups, reviews and srticles have been published on my life & works in the leading newspapers, magazines and books. All India Radiio, Jalandhar telecast, broadcast my talks and interviews by Doordarshan, Jalandhar. A documentary film of 30 minutes duration on Art and Jain temple Architecture directed and researched by me for Doordarshan, Jalandhar, was telecast on Mahavira Jayanti day in 1990. A documentary film of 30 minutes duration prepared on my life and works by Doordarshan, Jalandhar under the programme of Samvedana - was telecasted in March, 1990. I am associated with Art & Cultural Institutions, Organizations, Societies and Academies in the country for the promotion if Art and Cultural activities.